I love beets. One of my favorite questions to ask people is: What are your trigger ingredients? Which magic words make you perk up when you read them on a menu, and greatly increase your odds of ordering that dish? For me, the hero ingredient, the one that spawned this question in the first place, is beets. (Other contenders would be truffles, uni, heirloom tomatoes, and baby artichokes). So when I noticed that one of my favorite bloggers, Bouchon for 2, was inviting people to sing the praises of beets, I couldn't resist joining in. I usually cook golden beets. Partly because I think they're prettier and a little sweeter, and partly because they don't stain everything in sight blood-red. I wanted to pair the beets with some beluga lentils that I had lying around, and the rest sort of came out of that. I was originally going to have creme fraiche be the dairy component, but my cheese-loving husband requested chevre. He's not a cook, but he's a damn fine eater. 2. Wash beets very well, then place each beet on its own square of aluminum foil. 3. Drizzle beet with a bit of olive oil, then rub the oil over the entire surface of the beet. Wrap tightly in the foil. Repeat with the rest of your beets. 4. Place foil-wrapped beets on an oven-safe pan or sheet and roast beets for about 45-50 minutes, until you can pierce to the center easily with a fork. 5. Many people complain that peeling hot beets with their bare hands is painful. I've found that if I use a fork (or tongs) to hold the beet in place, I can sort of scrape the skin off pretty easily with a butter knife. (P.S. this technique also works with potatoes). 6. Once beets are peeled, set aside to cool. You can store cooked beets overnight in the fridge (in fact, according to the Zuni Cafe Cookbook, Judy Rogers feels this improves their flavor). Or, if you're a bad planner like I am, slice into wedges just before assembling your salad. I could not figure out why my orange and grapefruit vinaigrettes were not that tasty, and then I read Fields of Greens, which includes a splash of champagne vinegar in its recipe for citrus vinaigrette. I've made so many lemon and lime dressings, that it honestly never even occurred to me to add a second acid to my dressing. But now, of course, it makes perfect sense. 1. In a small, dry frying pan, toast the cumin seeds for a minute or two over high heat. I like to use a glass lid when I toast spices as the seeds tend to jump out of the pan when they get hot. 2. Grind toasted cumin seeds in a spice grinder. Cobras and Matadors in West Hollywood has this incredible lentil dish. It's the only place I've ever eaten crispy lentils...until now. 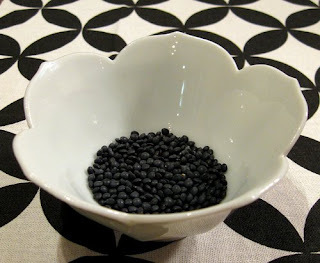 If you're like me and wish your whole batch of popcorn could be made up of those tiny little barely popped kernels you find at the bottom of the batch, then you need to try this technique for cooking lentils. I searched everywhere for the C&M recipe, but it was only when I decided to enter this contest that I came up the genius idea to search "crispy lentils" (duh). The source for this technique is The Toronto Star. Of course, I only realized my lentils needed to be soaked ALL DAY at around, oh, 5:30 p.m. Luckily, this is the kind of ridiculous thing I do all the time, so I know a little secret. You can actually soak the lentils in really really warm (almost boiling, really) water for about 20 minutes and all will be fine. If you really insist on doing it the long way, be my guest. Take your soaked lentils, drain, and dry them well. Then take about a tablespoon of olive oil and heat it up in a heavy-bottomed pan. When the oil is hot, toss your lentils in and stir for around 2-3 minutes (The Star says 5-8, but it didn't take anywhere near that long). Then salt to taste. Oh, the proportions aren't super important here. I knew I wanted to use my lentils as a garnish, so I only soaked/made ½ a cup. If I wanted to do this as a side dish, I'd fry some chopped pancetta, then toss maybe 1½ cups of pre-soaked lentils in with the pancetta, then sprinkle chopped parsley all over the top. Or maybe cook some sage in the pan instead of adding parsley at the end. Or use puy lentils. So many choices, really. 1. Divide the vinaigrette in half. 2. 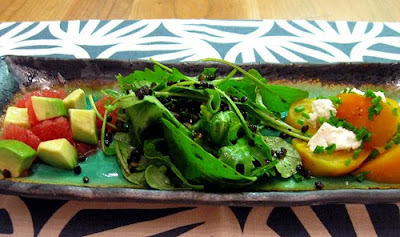 Place diced avocado in a large bowl along with three big handfuls of pre-washed arugula. Toss with half the dressing. Place a mound on the plate. Sprinkle crispy lentils over the top for crunch. 3. Slice beet into wedges. Arrange on plate. Crumble chevre on top. Drizzle a bit of the reserved dressing over. Sprinkle chopped chives on top. Made it this far? What are your trigger ingredients? I want to know! Any news on whether there is, in fact, a "beet season"? I made a beet salad tonight (with fennel, sliced orange, mint, and Italian parsley - the mint was the BOMB, but I digress) and the beets themselves were not very sweet or even beet-y. Which wasn't true a month ago when I was going beet crazy, but back then I was buying at the farmer's market instead of the produce store, so who knows. The Lucques cookbook, which is organized by season, claims that beets are good year round. For what it's worth, my beets were pretty tasty. Your recipe sounds fab! YUM. 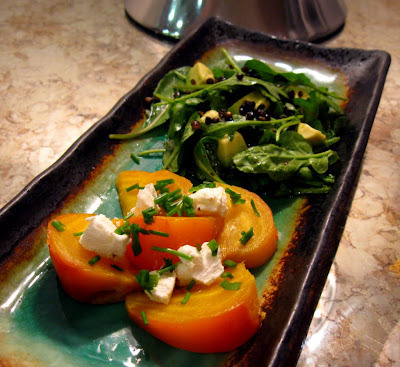 I love the way you put together these tasty salads/side dishes! My triggers are avocados, artichokes, tomatoes (in season), mushrooms, most vegetables when in season in some combination I've never tried before. My CSA is predicting a beet glut this year, so will check out that contest for more recipes!